ADATTATORE PER VIDEOCAMERE PROFESSIONALI CON OTTICHE INTERCAMBIABILI DA 1/2 POLLICE. CONSENTE DI POTER MONTARE LE OTTICHE DI OBBIETTIVI SRL / SRLD SULLE VIDEOCAMERE DA 1/2 di POLLICE. GRAZIE AL SISTEMA OTTICO INCORPORATO APOCROMATICO DI ALTA QUALITA' MOLTIPLICA LA FOCALE DEGLI OBBIETTIVI MONTATI PER 2, QUINDI UN 200 MM DI FOCALE SI TRASFORMA IN UN 400 MM , CONSENTENDO DI FARE AGEVOLI RIPRESE A GRANDISSIME DISTANZA. INDICATO PER EVENTI MONDANI E RIPRESE NATURALISTICHE DOVE SPESSO IL SOGGETTO DA INQUADRARE RISULTA ESSERE A NOTEVOLE DISTANZA. Si ricorda che essendo un raccordo meccanico il funzionamento rimane manuale. 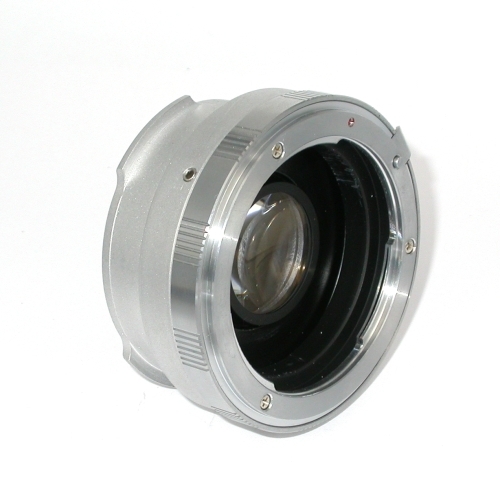 INNESTI DISPONIBILI: Nikon, Contax, Pentax, Olympus OM, Leica R, M42. 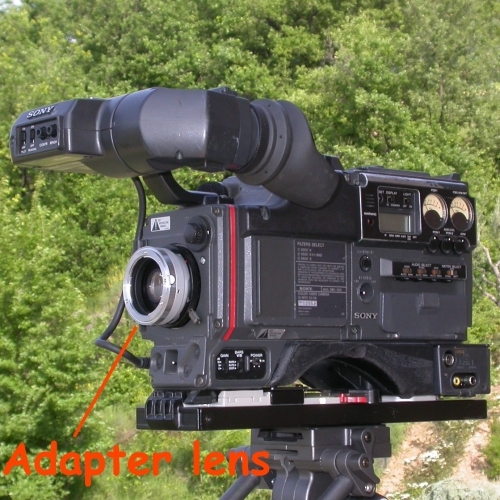 ADAPTER FOR VIDEOCAMERAS PROFESSIONAL WITH OPTICAL INTERCHANGEABLE TO 1/2 ". 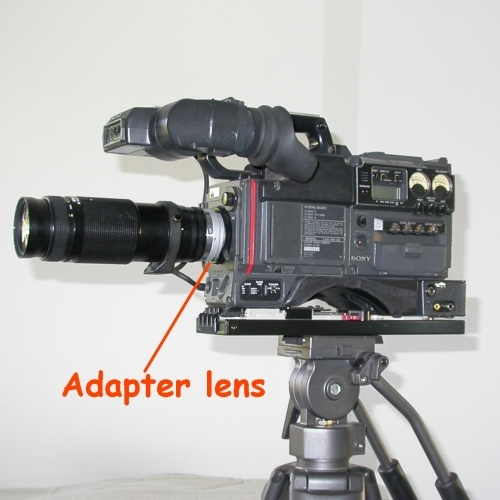 PERMITS TO BE ABLE TO MUONT THE OPTICAL OBJECTIVES SRL / SRLD OF THE VIDEOCAMERE BY 1/2 ". 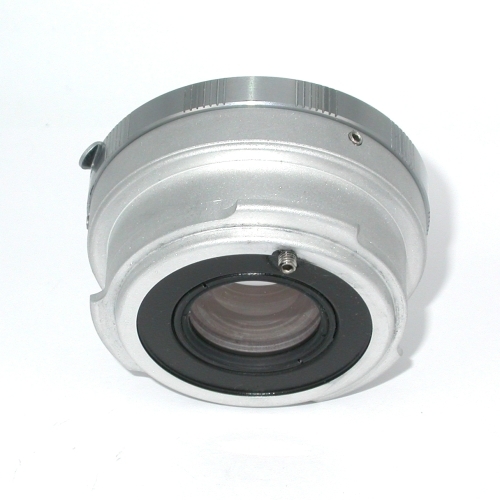 THANKS TO OPTICAL SYSTEM BUILTS APOCROMATIC MODE OF HIGH QUALITY MULTIPLAY THE FOCAL OF AIMS ASSEMBLED FOR 2, SO A 200 mm FOCAL TRANSFORMS ITSELFS INTO A 400 MM, ALLOWING FOR DOING EASY WRITEBACKS A VERI BIG DISTANCE. INDICATED FOR EVENTS OF THE WORLD AND OFTEN WRITEBACKS NATURE WHERE THE SUBJECT TO BE CLEAR TO BE CONSIDERABLE DISTANCE Nikon, Canon eos , Canon fd, Contax, Pentax, Olympus OM, Leica R, M42. WE REALIZE ALSO OTHER GRAFTINGS, ASK.